Nisha thought about the put-downs a lot of the time. Sometimes the others would talk just loud enough for her to hear bits and pieces of the conversation. She knew they were doing it on purpose, but she had become used to it. More recently, she had trained herself to quickly move away from the area if the mean kids started their loud whispering tactics. She knew that a good way to deal with the meanness was to talk it over with someone. Her aunt had become the person she could talk with anytime. She would talk about her innermost feelings and even share some of her ideas that no one else would be interested in. She knew she was lucky to have her aunt to talk with. Nisha also believed in writing down her thoughts in a journal. She would write pages and pages of her deepest thoughts, sometimes until her hand hurt from writing so much. She kept the journal hidden in her room where she was sure no one would find it. Sometimes she read over some of the pages she had written. It felt like she was peeking into someone else’s life. Now that she was enjoying summer break, Nisha was free of much of the meanness she encountered during the year. She had made a personal vow to stay away from social media sites and she mostly used email and text messaging to connect with her friends. Some of the meanest bullying had been on social media sites, and even though she tried not to let it bother her, those feelings had been hard to shake. Now she felt strong. She felt in control of her life and she believed she would be able to deal with whatever life presented to her. She had developed some solid friendships and she was now volunteering to help younger kids who were being bullied. Nisha knew she was making a positive difference. 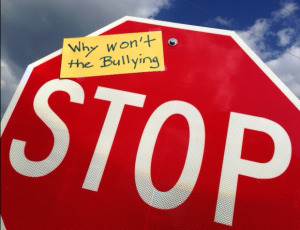 The above blogpost is a fictitious account of one person’s bullying experience to help readers relate to what life can be like for a person who is being bullied.